Did you ever hear the saying, “what goes around comes around”? That is the case with tile today. 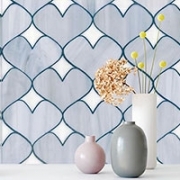 When I started in the Kitchen & Bath industry in the eighties, tile was all about pattern. Well, here we go again! Clients today are looking for patterns in both the splash and floor to create excitement and make a statement within the space. I had the opportunity this week to hear Erin Adams speak. Erin is one of America’s most celebrated product designers. 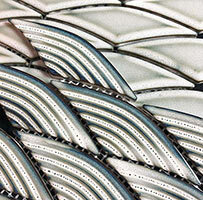 You may have seen her work with Ann Sachs over the years. Erin used a couple of terms that really said where the state of tile is today, “contained chaos” & “tile is art to architecture”. Each phrase is ever so true. 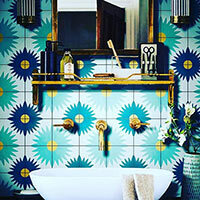 Tile today is trending to creating the focal point of the space and can add a sense of personal style. Some tiles that are available to accomplish this include geometric patterns, highly patterned encaustic cement tile, 3-d tiles & porcelain tiles that duplicate wood and stone. This new and exciting era in tile is a dream come true for The Hall Design Group as we continue to create not only functional spaces but also ones that add excitement and the client’s personality! If you would like John to keep you informed of the latest in kitchen and bath design news, tips and trends, sign-up to receive updates. Thanks for visiting!